Cuffern manor Country House B&B access statement. In this three storey house all the guest accommodation is on the first floor and our lift can provide access if required. The accessible shower/toilet added in 2008 can be a private bathroom if required. 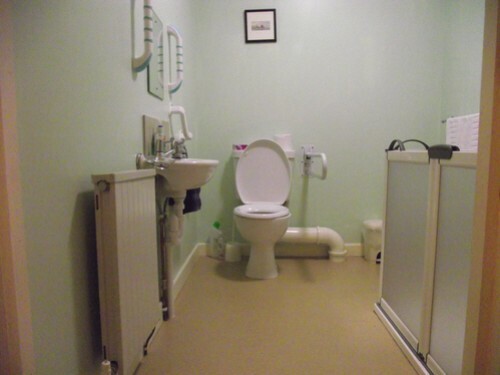 Two rooms adjoining it would suit a disabled person and his/her carer. Haverfordwest Station is about seven miles away – with services to Cardiff, Bristol and London. Bus routes run within a mile and a half of the house. We can provide details of suitable bus and taxi transport. The house is reached by a drive and cars can park at the entrance. There is room for many cars. There are no steps between the car park and front door, just a very gentle slope. We will be available to assist with your arrival and carry luggage to your room. The lift opening is 69cm wide. We can accompany guests if necessary when using the lift. All guest accommodation is on the 1st floor. The internal dimensions of the lift are 71cm x 92cm. All doors have a 76cm clear opening. There are no steps on any of the floors in the house, just the very wide staircase. There are two toilets on the ground floor. One is 215 x 120 cms and the other 230 x 255 cms. The larger one has disabled holds for the wc. There is a fire exit on each floor which has a 73cm clear opening. We can provide a radio receiver for guests to ask for assistance. Accessible shower and toilet on the first floor added in November 2007. Low level access shower with seat and hand rails. The front gardens are laid to lawn with some flower beds at the sides. The walled garden can be reached from the rear tarmac drive and via some rough ground. Although suitable for wheelchair access or people with sight difficulties, it is strongly recommended that they be accompanied. The walled garden has grass paths between the beds. The woodland around the outside of the walled garden has a rough path. We can provide information about access to places and facilities in the Pembrokeshire area, including wheelchair access to the Pembrokeshire Coastal path. If you let us know your requirements we will do our best to provide for them. The National Park has created a number of areas of the coastal park which are accessible to wheelchair users. These routes can be found on the national park website www.pembrokeshirecoast.org.uk. In June 2005, members of the Disabled Ramblers Association travelled to the area to try out some more adventurous routes in the Castlemartin area and the Preseli Hills in all-terrain trampers. Several beaches provide special wheelchairs for the sands. We had to post this review.